Online medical fundraising is the easiest way to help pay for medical bills. At DonationTo, we give you access to many useful tools to assist you throughout this fundraising process, including our one click email feature, social networking integration tool and many more. However we realize tools are only useful when there is a specific strategy in place. 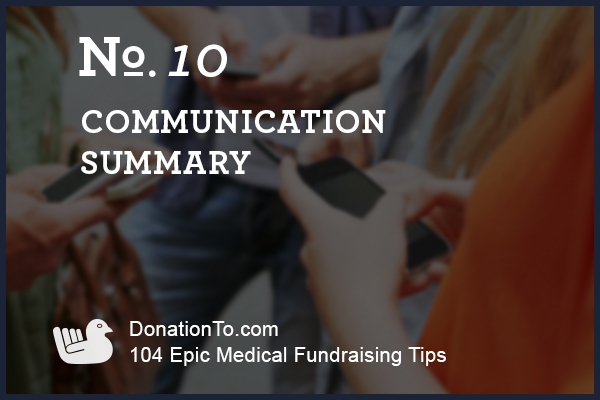 Below is our epic 101, medical crowdfunding strategy list. 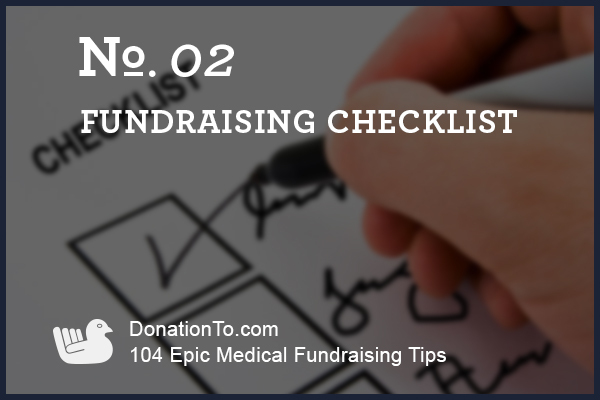 This list gives you specific step by step medical fundraising tips and strategies. These medical fundraising tips are of extreme value because they are contextualized in their proper timing. This means fundraising tips are of value but they are only of value if executed in the proper stages of your fundraising efforts. Fundraising has 4 different stages- preparation, starting, middle and ending stage. 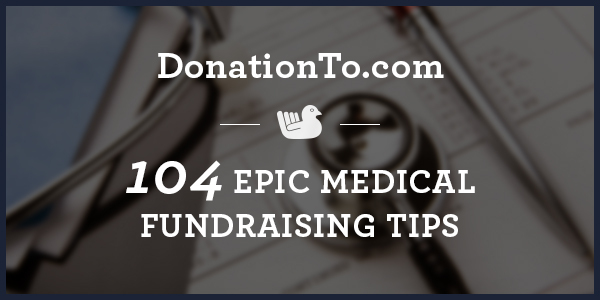 Our 101 medical fundraising tips are organized in those 4 stages below. We will also address what fundraising platform to use. There is a big debate about using free fundraising platforms that take 5% of all your donations vs. paid platforms (like DonationTo.com) that enable you to keep 100% of all donations and avoid credit card fees. It is important to educate yourself about proven fundraising techniques so that you can hit your medical fundraising goal quickly. With this in mind, we have compiled an extensive list of tips that you can follow to enhance your fundraiser. 1: Utilizing an online donation website gives you a centralized location for sharing information about your campaign and collecting contributions, but there is still a lot of work that needs to be done if you truly want to be successful. For example, you will need to take full advantage of social media and emails to get people involved. The reality is that no person can efficiently run a campaign by themselves, so we strongly recommend getting a small team together to assist you throughout the process. This can be your parents, a few very close friends or even a combination of friends and family. The important part is to bring people together who are committed to your cause. 2: Once you have assembled your team, you will need to determine the best tasks to delegate to each person. Everyone will have certain skill sets that make them invaluable to your campaign, and you need to utilize them appropriately. In other words, if your mother is extremely skilled with writing and typing, you can have her do all of your fundraising emails. Your sibling who spends all of their time on Facebook will be an ideal choice for your social media expert. Perhaps you have a close friend from college who became a graphic designer? If so, they will be perfect for the role of working with your fundraiser’s photos and videos. 3: Ultimately, the goal of gathering a small team of people to assist you with your medical fundraiser is to ensure that everything will keep moving smoothly without causing you to become overwhelmed. Additionally, sharing all of the necessary tasks with your team will allow everyone to contribute without spending all of their time focused on your campaign. This will help prevent everyone involved from getting burned out, and it will make them more likely to stick by your side until you reach your goal. As an added bonus, your close family and friends will feel touched by the fact that you think highly enough of them to get them involved. After all, sharing access to your page on our donation website for medical bills requires a lot of trust, but it will empower you and the rest of your team to make great things happen for the individual who needs financial assistance. There are several things that you need to prepare before you launch your medical fundraiser to help ensure that everything goes as smoothly as possible. The following checklist can be utilized to make sure that you do not miss any critical components. 4: Set up a PayPal or WePay Account: DonationTo has a payment processing partnership in place with PayPal and WePay. You have the option between using one or both of these sites, but research indicates that providing potential donors with multiple ways to pay will increase the total amount of online donations that you receive. Either way, you need to set up an account with one or both of these websites before you launch your page. The payment processing site of your choice will hold all of your marathon donations until you are ready to have them transferred to your checking account. With this in mind, it will also be imperative to connect your checking account to PayPal or WePay in advance so that you will be fully prepared to access your contributions right away. 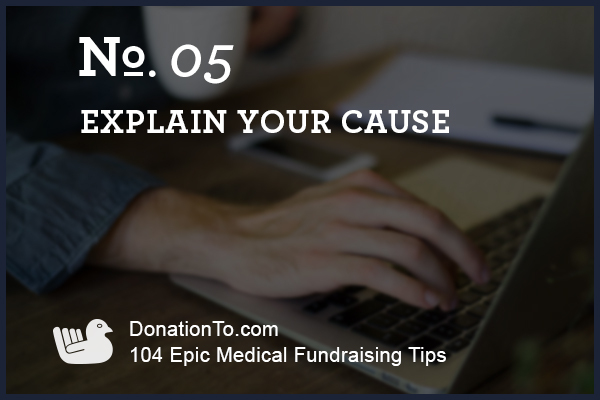 5: Provide In-Depth Details About Your Charity Cause: One of the most important aspects of your medical crowdfunding campaign will be written text that can provide each visitor to your page with in-depth details about your fundraising efforts. Our online donation website gives you an unlimited amount of space to offer this information, and it has been proven that visitors become more engaged and make larger donations when they are able to truly understand your cause. Therefore, you need to make sure that someone on your team is a good writer so that you can take advantage of this invaluable medical fundraising opportunity. 6: Utilize High Quality Photos: The pictures that you use to advertise your fundraiser need to be high quality and relevant to your campaign. Fortunately, this can easily be achieved with any smartphone, so it is not necessary to invest in expensive photography equipment. It is a good idea to see if someone on your team is handy with Photoshop because this will give you the ability to touch-up images in a variety of ways. 7: Get Your Videos Ready: Photos are an integral part of every crowdfunding page, and videos can provide you with even more forward momentum. This is another situation that only requires a smartphone, and you can easily upload your videos to YouTube to increase your fundraising reach. Ultimately, the purpose of photos and videos is to let people see a visual representation of the cause that you are asking them to assist with an online donation. Video is key in this context as there is a great deal of data that suggests those who make videos for their medical fundraising get more in donations. 8: Choose an Email Master: Email has been proven to be one of the most beneficial resources for acquiring new donations. Therefore, you will need to select someone from your group who is comfortable with the task of organizing email lists and sending out mass emails at the same time in order to help your medical crowdfunding campaign achieve the best results. DonationTo makes this easy as you can click 1 button and an email is sent to everyone in your contact this for any type of email account you have. 9: Social Media Owner: Just like email, you will need someone to become responsible for organizing every aspect of your social media outreach efforts. This will include organizing updates for the entire team to place on site such as Facebook, LinkedIn, Twitter and Google Plus. Keep in mind that posting these updates at the same time will help make your topic become trending, and this is a fantastic way to reach a wider audience. 10: Communications Expert: The person who fills this role will be responsible for ensuring that all fundraising announcements take place in a timely manner. 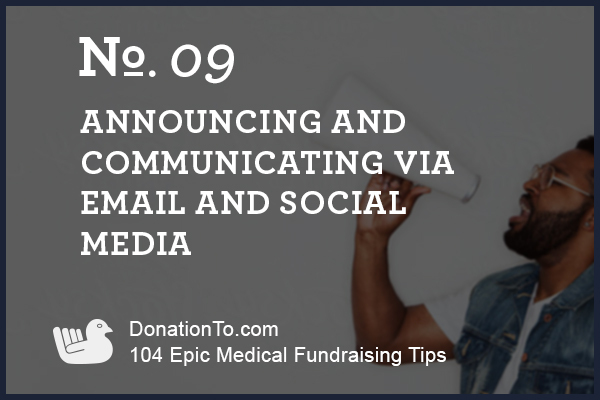 For example, after the initial announcement of your cause, you will need to provide updates on a daily basis to ensure that communication stays high enough to keep everyone connected throughout your campaign. This will make it much easier to hit your goal. 11: Bloggers: You need at least one blogger on your team who will write about the story of your fundraiser and place it on their blog. There are many benefits to using a blog format, including it gives you space to provide additional relevant details that will draw a deeper level of engagement from your donors. Additionally, blog posts will provide further validity for your cause, and this can help publications decide to feature your story. We understand that all of this preparatory work might seem like a lot, but setting clear expectations before your fundraising page launches will be the key to making sure that everything actually happens. It is also important to note that one person can own many tasks, so you do not necessarily need to have a different individual in charge of each aspect of your campaign. It is common for fundraisers to wear many hats throughout the process, and it will be much easier for this happen if you follow our template. There are several different fundraising services available, and the online donation website that you choose should be based around the specific type of campaign that you are running. Taking this approach will help get your campaign in front of the right potential donors, and it will also enable you to maximize each contribution that you receive. After all, every crowdfunding website has different pros and cons, but it is definitely possible to select a site that has been designed with your specific fundraising needs in mind. 12: New Products or Inventions: It is very common for people who are trying to launch a new product or invention such as a camera to turn to Kickstarter or IndieGoGo. There are many rules in place for these fundraising platforms, and it is necessary to go through an approval process before you can get started. For example, you will not be able to launch a crowdfunding campaign via either of these sites without offering product to each of your donors. Additionally, if you do not reach your goal in time, you will be penalized by either losing every donation or approximately 9 percent of the contributions that you have raised. Kickstarter or IndieGoGo are not ideal for medical fundraising, specifically because they are enable someone to raise money for a project, not for a cause. 13: Fundraising for a Personal Need: Any fundraiser that is not for an invention such as medical expenses, memorial fundraising or a natural disaster should be hosted through a service such as DonationTo.com or GoFundMe. There are a few major differences between these two platforms that you need to carefully consider. GoFundMe will keep 5 percent of each online donation, but DonationTo will let you keep 100 percent of your donations, and we will also enable you to avoid paying credit card processing fees. Here is how this works, if you raise $30,000 in three months, GoFundMe will keep $1,500 from your donations. Alternatively, DonationTo charges a small monthly fee of $9/month that is a total of $27 in a 3 month period. In other words, you will save $1,473 in this scenario by choosing DonationTo. Ultimately, the type of crowdfunding service that you select should be based around your campaign. Therefore, if you are trying to fund a project or new invention, it will typically make the most sense to use Kickstarter or IndieGoGo. However, if you are fundraising for a personal reason, you should definitely work with either DonationTo or GoFundMe depending on your preference with fees. We are pleased to offer a low fee environment, and our commitment to helping fundraisers reach their goal has made us the preferred platform for thousands of people worldwide. You will also receive much more than just financial benefits by choosing our approach. In fact, we offer a long list of tips and tools that will help everyone from novices to experienced fundraisers with the process of reaching out to potential supporters. The goal amount that you set for your medical fundraising campaign will have a big impact on your ability to collect enough money to take care of the afflicted individual’s medical expenses. It is important to note that asking for too much or too little can be very problematic, so you need to carefully analyze the situation. 14: Make an Itemized List: This list can be used to showcase the reason that you need people to make a medical donation. For example, telling people all of the different things that your goal amount will pay for will make them feel more inclined to get involved by making a contribution. This is basic psychology, and you should use it to your advantage. Many people end up hitting their goal only to discover that there are still many outstanding expenses. Taking the time to put together an itemized list will help you determine the exact amount that is needed for your specific cause. A great example of this can be found when Friends of Jeffrey Kish created a medical fundraising page using DonationTo. A few things to note – They listed all the item required for the medical procedure to give in-depth understanding of the nature of the cause. Now everyone can specifically relate to the cause and feel they will have a direct impact some aspect of helping. Also note they mentioned they were using DonationTo because they would keep 100% of all donations. By illustrating they will keep 100% of all donations will put donors in a good mindset to donate. 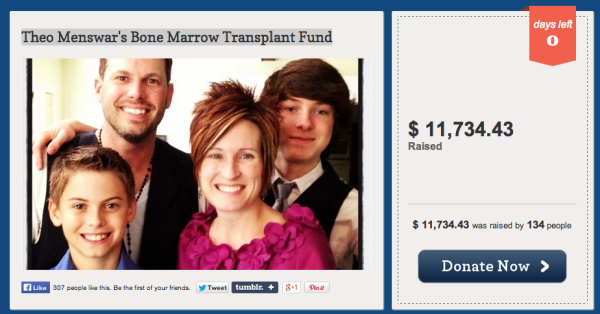 As a result one can see they reached their goal and also passed it raising $22,714. Keep in mind Friends of Jeffrey also used a DonationTo paid account that saved them over $1,200 in free that typically take place using free fundraising sites – we talk more about this later, keep reading. 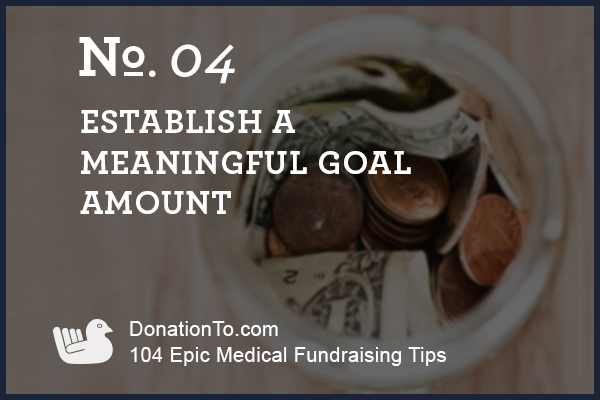 15: Make Your Goal Attainable: It is important that you do not set such a high goal amount that people feel like their online donation is essentially worthless. This is a problem that crowdfunding campaigns can have because a lot of donors will not give financial support to a cause that they do not believe will become fully funded. In other words, if you truly need to raise $150,000 for medical expenses, it might be better to split your campaign into 2 separate fundraisers so that each goal does not seem unattainable to your visitors. You can also get the ball rolling by having your close family and friends make a contribution to your medical fundraiser before you begin advertising your DonationTo page to other people. This will show potential donors that there is support for your campaign, and it will make them feel more comfortable with the idea of joining in by making a donation. We talk more about goal setting and asking for too little here. To read more about goal setting and asking for too much you can read here. We have already mentioned the importance of providing in-depth information about your fundraiser, but this is the part where most people make a mistake. It is easy to understand why you might not want to spend a lot of time writing out all of the details about your campaign, but you need to realize that your potential donors deserve to know as much as possible. In fact, the more transparent you are about your fundraiser, the more likely you are to meet or exceed your goal. Therefore, there are some specific issues that you should address on your medical fundraising page if you want to be successful. 16: What Are You Raising Money For? : Everyone who visits your page will want to be able to immediately determine if you are raising money for medical bills that were accrued due to an injury, illness or accident. 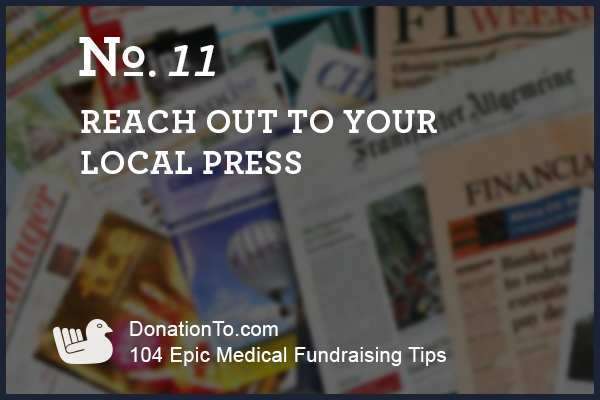 For example, if your medical fundraising efforts are intended to assist someone who was injured in a car accident, you will need to provide this information along with any news links that can help corroborate your campaign’s story. Again, transparency is critical, and offering these details will make people feel more confident that you will be utilizing their medical donation in the intended way. 17: What is the Nature of the Medical Issue, and Will it Require Ongoing Treatment? : Getting specific by including information about exactly what happened to the afflicted individual will help people relate to your cause. For example, if you are trying to raise money for someone who is battling with cancer, you will be able to receive a higher level of support by making this fact well-known. After all, everyone knows somebody who has had cancer in the past, and this causes most people to be more charitable about this specific illness. Additionally, letting people know whether or not the individual will require ongoing treatment is an important first step in explaining why you need to hit your goal, and it also builds awareness of the fact that you might need to host more fundraisers in the future. 18: What is the Significance of This Cause, and is it Time Sensitive? : People will be more likely to make a contribution if they understand that there is a sense of urgency. For example, if you are assisting someone with the fundraising process because they need a surgery that their insurance will not cover, you should let everyone know that this is what is happening. It will be much harder for your visitors to say no to your plea for financial assistance if they understand that their immediate medical donation could mean the difference between life and death. 19: Who Else is Helping? : It can be very beneficial to include a small blurb on your DonationTo medical crowdfunding page that indicates which family and friends are involved in your campaign. After all, some people will have previous experiences with these individuals, and examples of other fundraising campaigns from the past will make them feel more confident about your particular efforts. Keep in mind that everyone who is helping is also giving up a significant portion of their personal time, so it is a good idea to mention them so they feel recognized for their efforts. This type of social validations will reduce hesitation as visitors arrive to your page to donate. By having others already participating will make it more willing for others to join. We address this by also advocating having a few donations on your page before you announce your medical fundraising page. Again social validation here is that you don’t want visitors to arrive to a blank fundraising page. 20: What is the Timing and Deadline? : Your supporters need to be aware of any long-term goals. For example, if the individual will need medical treatment for the next two years, you need to make this information well-known. Doing this will help alleviate any concerns about how the money will be spent, and it will also answer questions that your donors will have about the medical process that will be followed as a result of their online donation. As an added bonus, telling people the anticipated timeframe and exactly what is happening will help them determine if they need to make a big donation immediately for a surgery or if they can space out smaller contributions during the treatment period. 21: What is the Goal Amount, and How Did You Reach That Figure? : Donors do not like being given a random goal amount. Instead, they want to have enough information to help them see exactly how you arrived at that figure. If you consider previous instances when you have been asked to assist a medical fundraising campaign, you should be able to easily understand why everyone will want more detailed information. The reality is that seeing a high goal without an explanation will make people feel hesitant to donate. However, you can remove this problem by being committed to offering full transparency with a list that details exactly how the money will be utilized. 22: Which Donation Website for Medical Bills Are You Using? : The technology that you use to collect medical donations will have an impact on whether or not you hit your goal. For example, if you are using DonationTo, you can let people know that we have provided you with a low fee structure that will enable you to keep 100 percent of the money that they contribute. This knowledge will make people happy and more comfortable with their decision to make an online donation. Therefore, make sure that you include a blurb on your page that explains why you chose our crowdfunding platform. Preparation Section VI – What is the Anticipated Schedule for the Necessary Medical Procedures? The type of medical procedures and how often they will be necessary will make a big difference in your medical fundraising efforts. Letting everyone know exactly what is expected will be extremely beneficial for your campaign. 23: Duration of Treatments: There is a major difference between a single procedure that needs to be done immediately and ongoing treatments to help the patient battle a serious medical problem. For example, helping an individual pay for chemotherapy should be approached differently than gathering funding to take care of one surgery. In fact, the type and duration of the necessary treatment will set the tone and urgency for your cause, and it will also directly impact many of the techniques that you will utilize to help increase the amount of online donations that you receive. 24: Crowdfunding for Multiple Medical Procedures: It is imperative that you let all of your potential supporters know the schedule for the anticipated medical procedures so that they know exactly what you need from them. For example, you will need to have one huge single push to raise money during a short period of time if you are trying to fund a single medical procedure. On the other hand, continual procedures that will be spread out over the next year will make it necessary to have several small campaign pushes to ensure that enough funding is available each time. Letting people know in advance what the schedule looks like will help them become prepared to make online donations as needed until the patient receives a clean bill of health. 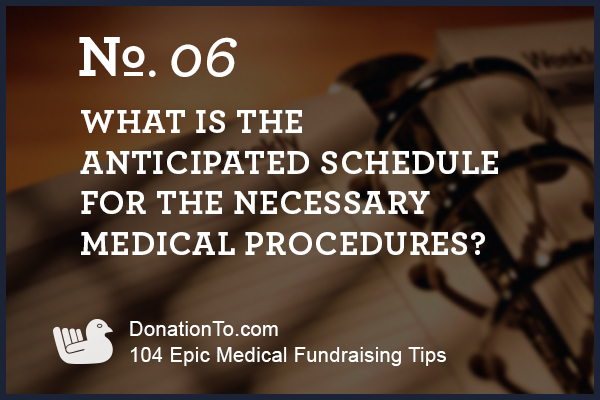 25: Provide Specific Dates: Everyone who contributes will want to know the scheduled dates for each medical procedure that they are helping to finance. There are many reasons that you need to provide this information. For example, creating a sense of urgency is an essential aspect of all fundraising campaigns, and letting people know the date of the next procedure will give them a firm deadline for making a donation. If you need to raise money for more than one procedure, you still need to list each applicable date as soon as the procedures are scheduled. This will give people an easy to follow guideline so that they can budget for each medical donation. After all, if your supporters know that there will be 12 procedures during the next 12 months, they will have the opportunity to contribute monthly instead of trying to come up with one large donation. In fact, spreading everything out and telling people exactly what you need can help dramatically increase the total amount of contributions that each supporter makes. Here is an example of how to organize your outreach for a multiple medical procedures fundraising scenario. Please note that the area in parentheses after each paragraph contains notes to help you learn how to craft the most effective crowdfunding page. These sections are for your personal usage only, and they should not be added to your public fundraising materials. My best friend, Sarah, has been diagnosed with cancer, and I need to raise $10,000 as soon as possible to assist her with her medical needs. Sarah will be going through multiple treatment stages, and it is my goal to raise this amount throughout each stage so that she can get the necessary treatment and focus on getting better instead of feeling crippled by medical expenses. If we can all join together to hit the $10,000 goal, Sarah will be able to receive each treatment in the aggressive cancer fighting plan that her doctors have put together. This is an extremely important fundraiser for me because I have known Sarah all of my life. We grew up together, and I know that many of my friends and family have also known Sarah for a long time. Therefore, I am reaching out to each of you to help Sarah during her time of need. I also want to ensure that we all stay connected throughout this process and do what we can to raise the funding that is required for her treatment. My parents have already donated $1,200 toward this very worthy cause, and I also received another $500 from the local coffee shop that Sarah and I used to frequent together. The overwhelming support so far has been tremendous, but we need much more to hit our goal! Every penny counts, so please make a medical donation today so that we can make sure that Sarah receives the help that she needs. We need to hit our $10,000 goal by [dd/mm/yyyy] to ensure that we get all of the funds required for Sarah’s treatments. Her doctors have stated that failure to receive each treatment will cause the cancer to spread further, and this will ultimately be very bad for her health. 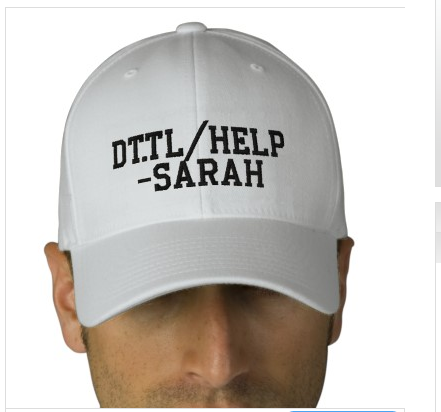 Sarah needs to receive a total of five treatments, and $10,000 will make this possible. I want to thank everyone in advance for all of their support and the heartfelt emails that Sarah has already started receiving. Sarah is a truly wonderful person, and I would do anything to support her and her battle with cancer. I know that all of you will do everything that you can to help too! We made the decision to use DonationTo.com as our medical fundraising platform because they enable us to keep 100 percent of each donation and avoid paying for extra credit card processing fees. In other words, we will be able to put every penny of your contributions toward Sarah’s medical expenses. PS: I have attached a schedule below of all five of the treatments that Sarah needs. Raising only $2,000 before each treatment will allow her to keep moving forward, and it will ensure that we end up hitting our total goal! Provide the date of the treatment, basic details about what exactly will happen on this date and an overview of how the $2,000 will be utilized. 26: An Example of a Previous Fundraiser: We hosted the “Friends of Jeffrey Kish” campaign, and they were able to perfectly execute the communication phase of their campaign in order to dramatically increase their likelihood of success. Ultimately, taking this approach made it possible for them to surpass their $15,000 goal. In fact, they ended up raising more than $22,000. We have chosen this particular fundraiser as an example for everyone to follow because they used a template very similar to the one that you have just read through. For example, they explained exactly what happened to Jeffrey, and they indicated that he had lost his job two months prior to the accident that severely damaged his left hand. After this introduction, they let everyone know exactly what medical steps were being taken and how each online donation would be utilized. They even provided a full list of dates, medical procedures and expenses so that each donor would have an immediate understanding of how their contribution would assist Jeffrey. This fundraiser contains a great example of how to introduce your decision to use DonationTo, and the page also includes two updates to keep everyone in the loop. 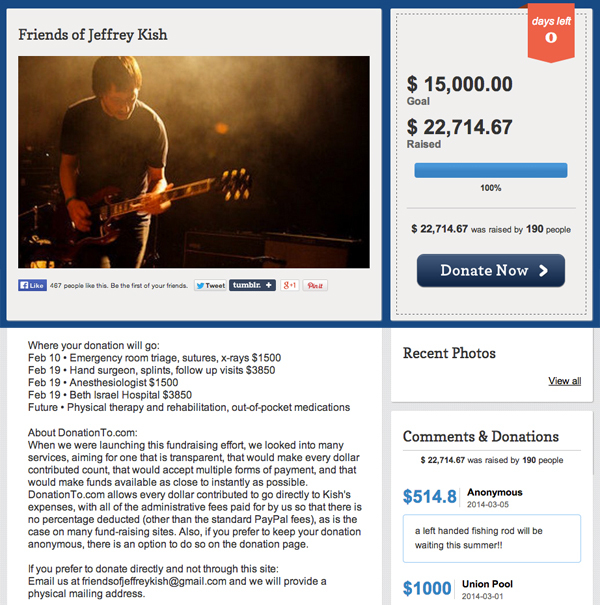 As you can see, the “Friends of Jeffrey Kish” campaign took full advantage of the template for medical fundraising success that is posted above. Their massive success highlights the importance of using each of the tips that are providing for you within this post. After all, the total amount of money that you are able to raise will be significantly altered by the steps that you take. Emulating the “Friends of Jeffrey Kish” fundraiser will put you in a great position to meet or even exceed your goal. 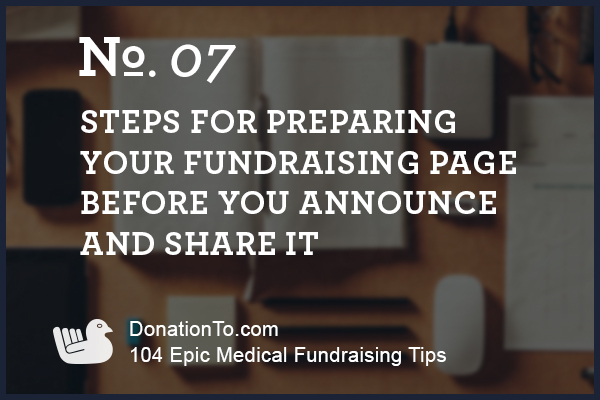 Taking the time to properly prepare your page before you announce it and begin sharing it with others will have a major impact on the quantity of medical donations that you receive. 27: Get Your Closest Friends Involved: We have touched on basic fundraising psychology before, and now it is time to once again consider how it will affect your campaign. The reality is that most people do not want to be the first person to make a contribution or leave a comment. Therefore, we highly recommend that you get a few of your closest personal friends to be the first ones to take the plunge so that visitors to your page will not see a zero balance. The best analogy for the situation is that clicking on a crowdfunding page that has not had any activity yet is similar to arriving at a party before everyone else. To put it simply, this is something that makes most people uncomfortable. Fortunately, ensuring that you have at least a few active users who have made donations before you begin sharing your page will make everyone feel more confident about donating, and it will also give them the motivation that they need to join the party. 28: Add as Many Photos as You Can: DonationTo gives you an unlimited uploads feature so that you can post a large quantity of images to your fundraising page. This will allow you to take advantage of the highly visual nature of the Internet, and it will also encourage your friends, family and the entire community to get involved. Uploading several pictures that include people from within your entire social network will cause each person to feel more motivated to donate. The key is to upload photographs of the specific people involved with the fundraiser along with their friends and family. For example, if you were in charge of Sarah’s medical crowdfunding campaign, you would want to post images that showcase her in her daily life with family and friends, and it would also be beneficial to let people see photos of her in the hospital. Posting pictures on a regular basis will increase the amount of return visitors that your page receives. However, even adding all of your photos at once will make a great first impression, and it will increase the validation of your campaign. 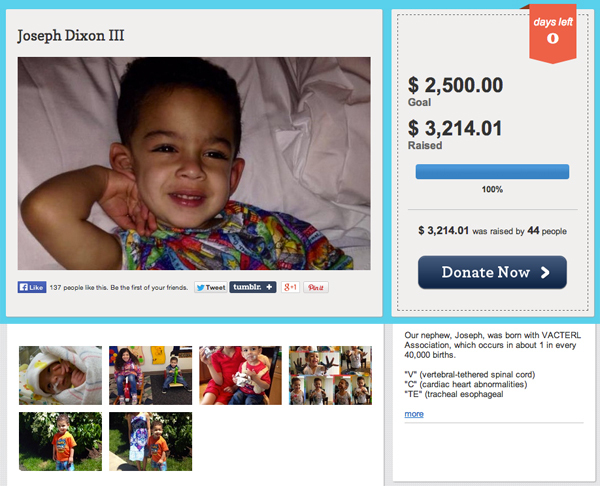 A great example of a medical fundraising campaign that used unlimited photos to reach their goal is Joseph Dixon III. You can see below they uploaded many photos to provided context to their medical crowdfunding efforts. In this case Joseph was born with VACTERL as they stated on their page “occurs in about 1 in every 40,000 births”. In just a few short months the Tran family was able to raise over $3,100 to pay for their medical bills! 29: Make a Video: Most smartphones make it easy to shoot video, and this is a great format for letting everyone know what your cause is about. In fact, it has been proven that fundraising pages that feature a video that explains their cause outperform campaigns that fail to take this step. It is not necessary to have a lot of experience shooting videos, but there are a few tips that you will want to use to get the best possible results. A good example of using video for medical fundraising is Naada’s Vision campaign. Here Naada specifically explains what happen to cause her injury. As you listen to her story there is nothing complex about the nature of the events. She was riding on a double decker bus and a tree branch hit her face and causing damage to her skull and eye. Immediately the story visually captures the true nature and urgency of her medical bills – We are thrilled to see she raised over $23,000 to support her medical bills. 31: Shoot in the Shade: Shooting your video in direct sunlight will cause harsh shadows, and this will prevent you from looking your best. 32: Utilize Sunrise and Sunset: The best natural lighting occurs during sunrise and sunset, and this will even have an impact on the videos that you should inside your home. Therefore, we highly recommend using one of these time frames to get the best lighting for your video. 33: Eliminate Background Noise: In order to get the best sound quality, you will need to ensure that you are shooting in an area with zero background noise. This will add clarity to your video, and it will make it easier for people to hear your message. 34: Act Natural: It is understandable to become nervous when you are on camera, but it is best to act natural and use your own voice so that visitors can see the real you. Naada’s Vision from Naada on Vimeo. 35: Carefully Select Your Fundraising Name: Your DonationTo page has a title area, and you want to make it as explanatory as possible. For example, if you are hosting a medical fundraising campaign for someone with cancer, you could name the page after this such as Sarah’s Cancer Fight. This will allow visitors to immediately understand the purpose of your page, and this is a great way to increase contributions. 36: Maximize Your DonationTo URL: DonationTo will give you your own URL to help you advertise your crowdfunding efforts. 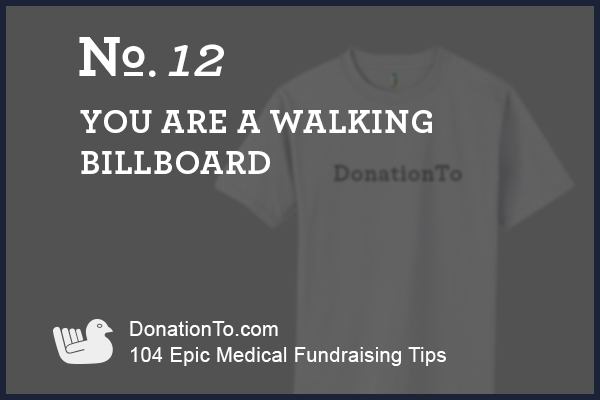 Everyone receives a free URL permalink that will look like this: www.DonationTo.com/Sarahs-Cancer-Fight. This permalink includes the name of your page, and it will give further validation of your cause to first time visitors. Therefore, you need to make sure that your page’s name is carefully thought out. 38: Think About Who Will be Reading the URL: Although the Internet gives you the opportunity to connect with people worldwide who are not affiliated with your cause in any way, it is most important to tailor your URL toward family and friends. With this in mind, you should pick a domain name that is very specific and relevant to your cause so that it will be easier for them to remember. Taking this step will help keep everyone on track with making a donation. 39: Keep it Relevant: The more relevant your URL is, the more likely you are to hit your goal. For example, sarahs-cancer-fight.com is extremely relevant and specific as it reminds your visitors of who you are raising money for and what their donations can accomplish. In other words, contributing will help Sarah with her cancer fight. 40: Keep It Short: The shorter your URL is, the easier it will be for people to remember and share it. 41: Use Hyphens if Necessary: It will not always be possible to get the exact URL that you have in mind. If you run into this issue, you can use hyphens to separate each word so that your URL will be unique but easy to read, remember and share. An example of this is highlighted in the URL sarahs-cancer-fight.com. You can find out more information about choosing the right domain name by reading more in our past blog post – 12 epic tips for selecting a domain name. 42: Include Information About the Fundraising Host: When you create your fundraising page, you will be given the opportunity to tell everyone who you are. This is a minor detail that can help provide a great deal of context for the people who visit your page. In this case, you can simply add your first and last name along with a headshot to help people immediately recognize the individual behind the campaign. This is a hyper relevant form of imagery that will really tie your fundraising page together for all of your first-time visitors. If you imagine what it is like to visit a crowdfunding page for the first time, you will be able to understand the importance of letting people know who is in need and who is spearheading the effort to help them. Providing this information will make people feel more comfortable, and it will help you get your fundraising page moving much more quickly. At this point, the preparatory work for launching your crowdfunding page is nearing its completion. However, there are certain factors that you need to firm up before you will be ready to tell the world about your need for contributions. 44: Get Your Team Organized: If you have gathered at least three people together to act as your fundraising team, you are already off to a good start. If you have more than three people, this will be even better. Either way, the idea is to ensure that everyone is on the same page before you launch your campaign. Fortunately, we have a simple checklist that you can review the day before your efforts go live. 45: Check Your URL: It is critical to make sure that your URL is working properly. 46: Are Your Emails Consistent? : You can easily share documents with each other via Google Docs. This is a fantastic way to make sure that you are all using the same type of verbiage in the introductory emails that you will be sending off in the morning. We talk more about this in our 15 fundraising email tips here. 47: Have You Assigned a Social Media Blast Time? : One of the best ways to capture attention and make your campaign go viral is by getting everyone who is involved in the campaign to post information on websites such as Facebook, Google Plus, LinkedIn, Twitter and every other social media site at the same time. For example, you could all commit to posting on Facebook at 9 a.m., followed up by a post on Google Plus five minutes later. 48: Do You Have a Daily Schedule in Place? : Many people erroneously place the majority of their focus on the first day of their campaign. Although this is critical, you need to make sure that you do not lose momentum after the first day. Putting a schedule in place will help you keep your campaign moving forward, and this will make it much easier for you to reach your goal. 49: Do You Have Donations, Comments and Photos in Place? : Remember that no one likes to be the first person to arrive at a party. Therefore, you need to have a few donations, comments and photos already in place before you widely launch your fundraiser. If you have already achieved everything on this checklist, you can consider yourself off to a fantastic start. The next thing that you need to focus on is getting your URL in front of as many people as possible. 50: Useful Places to Share Your URL: The more places that your URL is listed, the better your end result will be. To help you with this process, we have compiled a few tips that everyone on your fundraising team can easily follow. You should also encourage your other friends and family to do the same thing to raise awareness of your campaign. 51: Email Signature: Every major email provider gives you the ability to set up a default email signature that will attach itself automatically to the bottom of your emails. For example, you could build a signature that says “Help Sarah in her battle against cancer. Visit www.sarahs-cancer-fight.com to get involved.” If possible, you should add this signature to your personal and work emails to get it in front of the largest amount of people. 52: Chat Status Message: Most chat services such as Gmail, Skype and AOL give you the opportunity to have a status that everyone can see. Taking advantage of this status by using it to share information about your campaign is a great way to raise awareness. 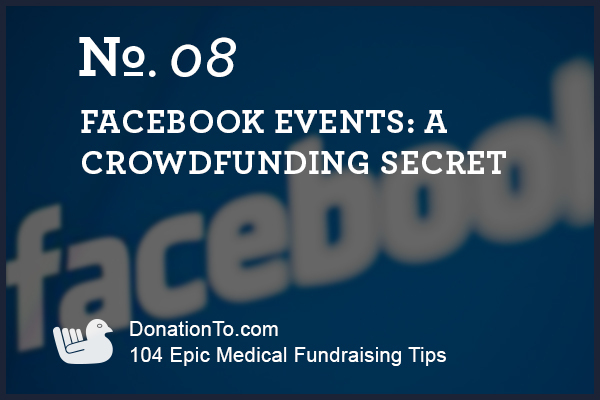 After all, there are probably several previous examples from your own life when you learned about something important via a status update, and you want to use the same format to tell others about your fundraiser. 53: About Section of Facebook: Every Facebook user has the ability to fill out the “about” section of their profile with information that pertains to their life. In this instance, you should utilize this section to give people basic details about your campaign. Make sure that you include the URL to your DonationTo page. Keep in mind that a wide variety of people will see your “about” section, including those who are not friends with you. This makes it a prime piece of Internet real estate, and it is critical to take advantage of this space. 54: About Section of Google Plus: This section should be used in a similar manner to Facebook’s. Include basic information about your fundraiser, and do not forget to include your URL. Remember that people who are curious about your life are likely to check out your “about” section, and you can utilize this to assist your campaign. 55: About Section of LinkedIn: Again, the “about” section of this social media site can be used to raise awareness of your fundraiser. LinkedIn is a professional social media site, so anyone who visits your page with the intention of learning more about your business accomplishments will also receive information about your medical crowdfunding efforts. 56: Profile Section of Twitter: Everything about Twitter requires a more minimalistic approach, and this includes the profile section of your page. However, you should still have more than enough room to do a basic introduction to your campaign and include the URL. Anyone who visits your Twitter profile will be exposed to this information, and that can definitely have a big impact on the total amount of money that you raise. 57: Your YouTube Channel: YouTube gives you the ability to provide basic details about yourself and your channel with visitors, so this makes it a great place to share the URL of your medical fundraiser. Make sure that you also include at least a few details to give people more of a reason to visit your crowdfunding page. If you are an active YouTube user, you will most likely receive some support from people who enjoy your videos. One of the most important aspects of sharing information on all of these different platforms is the added value that you will receive from getting others to do the same thing. Therefore, you need to make sure that you include your DonationTo link so that everyone can find out more about your campaign and make a donation. Additionally, it is a good idea to personally ask your closest family members and friends to take the same steps with their email and social media accounts. The answers are practically endless when the Facebook status update box asks you “what’s on your mind?” You might be thinking about the delicious burrito you just had or perhaps you want to share a funny image that you found on StumbleUpon. Regardless of what is on your mind, posting an update on Facebook allows you to broadcast this information to all of your friends. Naturally, this can be a very powerful feature in the context of fundraising. You are probably thinking that if you type out a few lines about your cause and click share that all of your friends will instantly see your message, but this is not exactly how things work. You have probably had several situations when you posted a link or image only to hear some of your friends say later “what? I never saw that on your wall.” The reason that this happens is the fact that Facebook uses an algorithm to determine which of your friends will receive each of your particular updates. Due to the enormous size of Facebook’s membership base, the website is tasked with perpetually organizing an incredible amount of information from its users. Due to this, when a user posts a status update, a web programming technique that is referred to as behavioral targeting is enabled to help streamline the flow of data. As a result, each status update that you make will only be displayed to a subset of friends who Facebook considers relevant to the content of that specific update. For example, if you are a big sports fan and regularly post updates about your favorite team, you will be much more likely to see updates from friends about that same team than random updates about other aspects of their lives. When you consider the implications of how this will impact your efforts to raise awareness of your medical fundraising campaign, it becomes clear that status updates are not the best implementation of Facebook for your specific needs. However, this does not mean that you should avoid using Facebook. Instead, you simply need to utilize a different technique in order to be able to reach all of your Facebook friends to gain support for your cause. 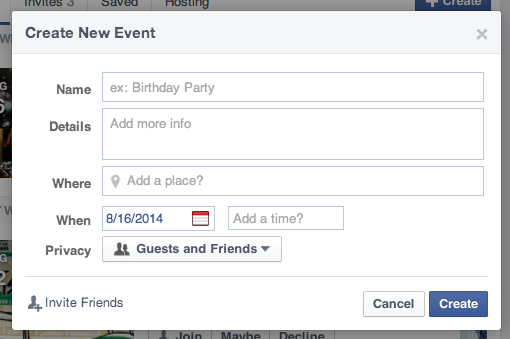 The best method available is the Facebook Events feature. After all, creating an event on Facebook gives you the opportunity to actually reach 100 percent of your friends. This enables you to leverage your social network by spreading the word for free in order to gain support for your cause. How Do I Set up an Event Page? 58: Name Your Event: The name that you give to your event will have a big impact on whether or not people actually click on it, so make sure that you choose a relevant name that will allow people to instantly recognize your need for their assistance. 59: Choose Online as the Location: Most events that are advertised via Facebook will take place in an actual physical location. Therefore, you need to select online for your location, and you also need to include a note to remind people there is no physical location to visit so everyone can get involved. 60: Set a Start and End Time: Your event will remain active and easily accessible until the end time that you specify. Listing a specific start and end time will also let people know exactly when their help is needed. 61: Provide More Information: Giving an in-depth description that provides your social network with more information about your cause is imperative. Although you need to provide your DonationTo page URL and ask for support, you want to make sure that you also list the reason for your campaign so that people will feel more compelled to join in. In fact, the more information that you include, the more contributions you will receive from this outreach effort. 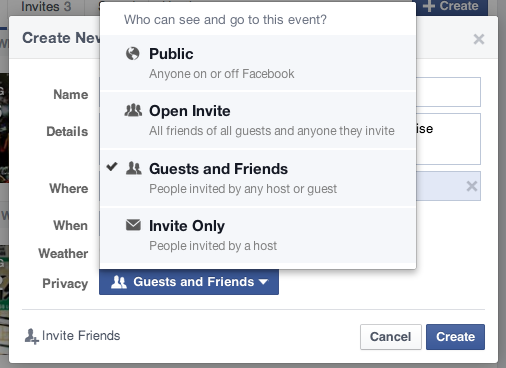 62: Ensure That This is an Open Event: Facebook gives you the opportunity to make your event open, closed or secret. Closed and secret events make sense when you are having a personal gathering, but they are not the route to take when you need to raise money for a worthy cause. Selecting the open event option will give all of your supporters the ability to easily share your event and invite their family and friends to participate. This is one of the best ways to gain additional supporters, and you should ask everyone to take these steps. 63: Enable the Event’s Wall: You have the option to allow each person who was involved with your event to add posts, images, links and videos to the event’s wall. Additionally, everyone who has already joined the event will be able to invite their friends. Making these options available will increase interaction, and this will make it much easier to raise awareness of your cause. 64: Invite Your Friends: Facebook allows you to invite an unlimited number of friends, but you can only choose 100 of them at a time. In other words, if you have 1,000 Facebook friends, you will need to divide them up into groups of 10. Please note that Facebook also allows you to add a personal note to your invitations, and you should take advantage of this feature in order to send out a meaningful message about your campaign. Simply creating the event is not enough. Instead, you will need to regularly monitor your event page after it is completed. Taking this step is a critical aspect of effectively implementing this particular Facebook strategy. After all, your visitors will ask questions and post comments, and you need to be able to provide additional support by replying to each person in a timely manner. Do not be surprised if some of your supporters ask you for additional ways that they can continue spreading awareness of your fundraiser. In this case, you can kindly ask them to create their own events to gain additional reach within their extended network of family and friends. When other people create a Facebook event for your cause, they will raise awareness and increase engagement via their network. Ultimately, this will result in much more visibility, and it will increase your likelihood of receiving additional contributions. Make sure that you thank people who become involved by creating their own event. The planning phase of your medical fundraiser is absolutely essential, but you also need to communicate throughout the entire campaign in order to make people aware of your cause. Additionally, communicating regularly will show your friends and loved ones how much you care about this specific cause, and it will also give them the knowledge of what you expect from them. For example, sending out regular updates that highlight how much money you still need to raise will make it clear that you need everyone to get involved. To help you with this process, we have put together a template of the basic essentials so that you can learn how to plan your communication for all medical crowdfunding related campaigns. 65: Double-Check Your URL: As previously mentioned, setting up your URL is a key element of running a successful campaign. Before you begin announcing and sharing your cause, you need to make certain that your URL works properly. 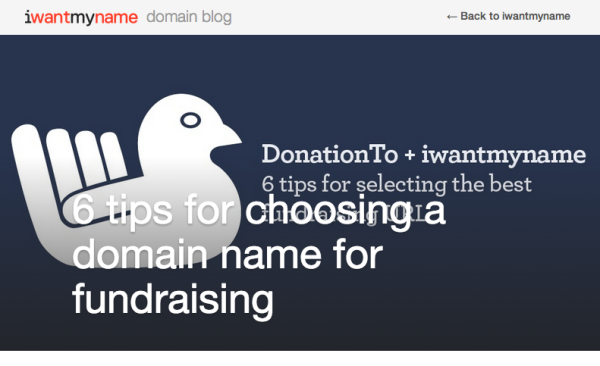 It does not matter if you purchased your own domain name or are using a DonationTo permalink. What does matter is double checking to ensure that everything is working properly before you begin sharing information about your cause with your family and friends. Consider for instance how you have responded in the past when you have received an email with a dead link. The odds are high that you did not waste any time trying to get the link to work or checking it again in the future. All of your potential supporters have busy lives, and you need to be cognizant of the fact that you will lose their attention if you do not get your URL right the first time. Taking just a moment to double-check everything will give you a much smoother fundraising launch experience. 66: Email the URL to Your Family and Friends: Now that you are certain that your URL is working properly, you should email it to all of your family and friends. This initial email does not need to be extremely long, but you should tailor it so that all of your viewers will be able to understand the importance of clicking on the link. We are including an email template below that will give you an idea of how to get started with this process. Just remember that the specific email is exclusively intended for the purpose of letting friends and family know that your fundraising page exists. I have created a fundraising page to raise $10,000 for Sarah’s medical bills. My fundraising page is located at DonationTo.com/Raise-Money-For-Sarah. I would love to get your support, and it would also be extremely helpful if you could share my cause today to help me reach my goal during the upcoming months. Once again, you can donate here: DonationTo.com/Raise-Money-For-Sarah. We have had amazing support so far, and we are asking everyone to share funny stories about Sarah when they donate! As a note, you can make your first email more effective by getting a few of your closest family and friends to send out a mass email to everyone on their contact list at the same time. Taking this step will help your donation page become viral. For example, if your entire fundraising team and a few other friends send a message to all of their family and friends that encourages them to get involved, you are much more likely to end up with a high level of traffic and engagement during the first 24 hours. This is a good example of taking advantage of the potentially viral nature of the Internet, and it can help you gather a lot of support very quickly. A high level of engagement via social networking is the best way to get your fundraising efforts to go viral. Therefore, we highly encourage you to utilize each of the following tips. 68: Plan a Time for Everyone to Share the URL on Facebook: Scheduling a specific date and time for all of your supporters and everyone on your fundraising team to simultaneously post the URL to your campaign on Facebook can have a huge impact on the total amount of medical donations that you receive. For example, you can have everyone post the URL on their Facebook profile at 1 p.m. on Tuesday. Doing this will greatly increase your chances of having your URL go viral, and this can dramatically increase the amount of people who find out about your cause. 69: Have Everyone Ask a Question and Tell People How to Donate: It has been proven that viewer engagement goes way up when Facebook posts specifically ask questions and provide a strong call to action. For example, asking a question such as “what is your favorite funny story about Sarah?” will get your visitors to leave comments, and this will increase your engagement and spread your cause to a wider audience. It is also a good idea to use a statement such as “share a funny story about Sarah when you donate to help her fight cancer. View her fundraising page here and donate now!” Make sure that you paste the URL after this statement so that people can easily take action. Again, a statement of this type will get your visitors more engaged with your post, and this will help your cause become a trending topic that people within and outside of your social network will be able to find. 70: Make Sure Everyone Understands the Importance of Responding to Comments: Getting your family and friends to share the URL to your crowdfunding page at the same time should be only half your goal. After all, each person who participates will also need to understand that they need to be able and willing to respond to comments in order to increase donations. For example, if someone asks a question on your friend’s post about your fundraiser, your friend needs to answer it in a timely manner. Additionally, you should encourage everyone who has joined in with your group post at 1 p.m. on Tuesday to click like on each person’s response to their post. Liking and replying to comments is another way to increase engagement, and this will once again improve your chances of having your campaign go viral. 71: Expand Your Reach to Other Social Networks: Facebook is a great place to get started, but you need to drive user engagement across every possible social network. Therefore, you should follow this same process with Twitter, Google Plus, LinkedIn and other major international social networks. Keep in mind that not everyone has a Facebook account, and you do not want to miss out on every possible opportunity to gather financial support for your cause. 72: Draft an Update Email: The second week of your medical fundraising campaign is the perfect time to give all of your supporters an update about how much money you have already raised. Additionally, this update email can be used to ask everyone to share your URL. In other words, instead of making a targeted request for donations during this communication, you should encourage everyone to get involved by helping others find out about your cause. For example, you might have some family and friends who can greatly contribute to your fundraiser by taking steps to raise awareness. After all, asking these people to share the URL to your DonationTo page could easily help generate a much larger quantity of donations. 73: The Importance of Sharing Your URL: Each of your family and friends has their own extended network of friends and family members, and they are all a potential resource of medical donations. For example, if you are raising money for a cancer patient, you are likely to receive support from people who you have never met because they have known someone who passed away from this deadly disease. This level of support can only be received if you get all of your friends and family members to share the URL with anyone relevant within their social network. In other words, even if they do not want to share the URL with everyone they know, they should at least pass it on to individuals who they believe would be interested in helping a campaign like yours. 74: Tailor Your Emails to Each Recipient: It is easier to send out one mass email like you did during the first week, but taking a personal approach during the second week can have a massive impact on the total amount of contributions and URL shares that your campaign receives. After all, everyone likes to feel like they are being personally recognized, and taking this approach will make them feel more involved in your fundraising efforts. There might be some people who you are unable to do this with due to a lack of familiarity, but any of your close family and friends should receive a message during the second week that asks them to share your URL and contains personal information so that they know you are speaking to them directly. It was really great seeing you last week in New York City. I will actually be back there in June, so we should definitely have dinner again! As you probably already know, I have created a fundraising page to raise $10,000 for Sarah’s medical bills. This fundraising page can be found at DonationTo.com/Raise-Money-For-Sarah. I would love to get your support, and it would be extremely helpful if you could share my cause today to help me reach my goal during the upcoming months. It would also be very helpful if you posted the URL on your social networking profiles! You can simply copy and paste what I have already drafted for you below to make this process as easy as possible. You can email this message as well to your relevant friends and family members, and this would be greatly appreciated! I know that you liked those cookies the last time we saw each other, so when I come back to New York City in June I will make sure that I bring you some! I saw that New York City received about five inches of snow yesterday. Try to stay warm! 75: Share Your Message Via Multiple Communication Platforms: Now that you have an easy to tweak draft for your second week message, you need to reach out to people via their preferred communication method. For example, some people will communicate with you via email each time, but others prefer to use the Facebook chat window or text messaging. Therefore, you should take these messages and paste them into the appropriate format. Sending out your second week update via chat, email, social media and texting is the absolute best way to capture a large amount of support for this portion of your campaign. Keep in mind that reaching out to everyone via various communication platforms will increase the impact and timeliness of your message. In other words, if your best friend is always on Facebook, send her a message by pasting it into the Facebook chat window. On the other hand, if your sister only visits Facebook once a week, you will need to email or text her your update to make sure that she sees it more quickly. 76: What Is the Status of Your Fundraiser? – During the third week, you can take your baseline email template from above and perform a few small edits that will help you address specific points that your followers will want to know about. To help you with this process, we have compiled a list of five questions that you need to answer during the third week. Following this guideline will make your donors feel more connected to your campaign, and it will also encourage some of them to make an additional contribution. 78: How Far Are You from Your Goal? : Everyone who is involved in your medical fundraising campaign will want to be able to see that you are continuously making progress. Finding out exactly how much more money you need to raise will also give people the push that they need to make their first contribution or to make an additional online donation. For example, if your goal update indicates that you are off to a really good start, some of your donors might make the decision to contribute again in order to get you past the finish line. Alternatively, if your update indicates that you are not off to a very good start, people who have been waiting to make a donation will be more likely to step up and contribute to your cause to help move it forward. Either way, providing factual information about the amount of money that you still need to raise is one of the best ways to gather all of your supporters together for a big push so that you can get closer to your goal. 79: What is the Latest Update on the Person or Thing That You Are Fundraising For? : It is also vital to keep people up to date on any positive or negative changes with the person or thing that you are raising money for. In the example of Sarah’s cancer fighting fundraiser, your third week update should contain information about how her medical treatments are progressing. People need to know the truth about whether or not she is responding to treatment, and it is a good idea to let them know if she is currently hospitalized. These type of details will keep people more personally involved in your campaign, and it will help remind them of the importance of making a medical donation. As an added bonus, letting your supporters know when the individual is hospitalized will give them the opportunity to provide emotional support by visiting in person or sending a nice card. Medical research indicates that cancer patients have a higher survival rate when they receive a lot of emotional support from their family and friends, so make sure that you focus on this aspect of your campaign as well. 80: Are You Are Ahead or Behind Your Goal? : At this point, you should have reached a certain percentage of your total goal amount. For example, if your campaign is going to run for 10 weeks, you should be at least 30 percent of the way to your goal by the end of the third week. Letting people know that you are ahead of this goal will make them feel encouraged to help you continue building your forward momentum. Alternatively, if you are behind your goal, people who believe in your campaign will feel the desire to help you make up lost time. As you can see, there are psychological benefits to being open about your campaign’s progress, regardless of whether or not things are going well. Make sure that you remain transparent throughout your entire fundraiser, and always take the time to thank people for their support. Following these two steps is a recipe for success, and this can have a major impact on the total dollar amount that you end up with on the last day of your crowdfunding campaign. 81: Do You Have a Stretch Goal? : If you have already reached your goal, it will be important to let your supporters know if you are now going for a stretch goal. The purpose of a stretch goal is to take care of other related aspects that you were not originally focused on. For example, $10,000 might pay for Sarah’s medical treatment, but it will not do anything to help her keep her other bills paid while she is unable to work. Therefore, if you have already reached your $10,000 goal, you could set a stretch goal of $15,000 in order to help take more of the financial burden off of Sarah’s shoulders. The great thing about a stretch goal is that any extra money that you receive will be beneficial, and you will also be able to take advantage of your campaign’s current momentum in order to keep things moving forward. We have hosted several fundraisers that have ended up setting multiple stretch goals, so we definitely recommend that you utilize this opportunity if there are other related expenses. Keep in mind that the same level of details and transparency that you offered people for your original goal should be included for each stretch goal. Failure to do this might make your supporters question the integrity of this extra portion of your fundraiser, and this will make it very hard to hit your next goal. Now that you have had the opportunity to review a few good examples of contextual updates, it is time for you to try creating your own weekly updates. You need to send out an update during each week to everyone who is supporting your campaign, and every message needs to be relative to the specific timing of your fundraiser. For example, the announcement always comes first, and the second week is the perfect time to ask people to share the URL to your DonationTo page. As a reminder, it is an imperative to make sure that your crowdfunding page already has a few donations before you begin sending out notifications about your campaign. Remember that no one likes to be the first person to arrive at a party, and sending out your URL before a few donations and comments are in place will make people feel like they are experiencing the virtual version of this uncomfortable situation. Therefore, make sure that you have at least a few close family members and friends start things off with donations and comments before you move forward with your efforts to raise awareness of your fundraiser. 82: Week One: The Announcement of Your Fundraiser – This initial communication needs to give people basic details about your crowdfunding page so that they will understand that their assistance as needed. For example, you can tell people Sarah has cancer and needs $10,000 to receive the necessary medical treatment. After you provide this intro, you should ask everyone to make a contribution by visiting your DonationTo page. Make sure that you include the URL, and do not forget to check the URL in advance to ensure that it is working before you begin your marketing efforts. 83: Week Two: Ask Your Supporters to Share Your URL – Now that your supporters are aware of the importance of your campaign, it is time to get them to help you raise awareness. For example, your second week update can include a request for everyone to copy and paste a short message that you provide into their social media status updates and into emails that they send to their family and friends. This is a fantastic and proven method for spreading the word about any type of fundraiser, and it will also make everyone feel more personally invested in your campaign. 84: Week Three: Give Everyone an Update to Help Create a Sense of Urgency – Letting everyone know how much money you have raised to date and whether or not you are on track to hit your goal is the perfect way to urge people to make additional contributions. Consider for instance how you would react if a cause that you really believe in was having difficulty gathering enough financial support. The odds are high that you would feel that it was necessary to increase your online donation, and you would probably also take a few moments to share information about the campaign with your extended social network. The same thought process is true of almost everyone, and you can use it to your advantage to increase donations. It is also always important to make people understand the limited nature of your campaign so that they do not keep putting off their contribution. 85: Week Four: Send Some Images of Your Fundraising Efforts – People like to see a visual representation of whatever cause they are being asked to support, so you should definitely attach some photos to your fourth update. For example, if Sarah is now in the hospital, you can take a picture of her sitting up in her hospital bed waving to all of her supporters. This will let everyone see that she truly is in the middle of a serious medical situation but is still in good enough spirits to thank everyone for their support. As a reminder, DonationTo gives you the ability to upload an unlimited amount of photos, so you should also place any new images on your crowdfunding page. 86: Week Five: How is the Person Doing? – During this update, you should provide written details about the person’s medical progress, and this is also the perfect time to give everyone another update on the total amount of money that you have raised. You sent some photos in week four, and it is a good idea to continue with imagery during week five. For example, regardless of whether or not Sarah was actually featured in any of your pictures from week four, you should definitely include a photograph of her during week five. Seeing the person who is directly impacted by each online donation makes people more inclined to continue giving because it adds more legitimacy to the campaign. 87: Week Six: Begin Repeating One Through Five – There will be new people learning about your fundraiser on a daily basis, and you want to make sure that everyone stays in the loop. Therefore, it will be highly beneficial to repeat the same basic crowdfunding update schedule every five weeks. For example, you can use the sixth week to send out another quick blurb that reminds everybody what your efforts are all about. This will serve as an introduction to new supporters, and it will be a nice summary reminder of the purpose behind your campaign for everyone who has been involved since the beginning. As an added bonus, repeating your previous updates with slight tweaks to keep them relevant and up-to-date will make the entire process much easier. Now that you have created a well-tailored fundraising page that includes plenty of photos, videos and donations, it is time to reach out to the local press. After all, getting your local news channels, newspapers and well-known bloggers to run a piece about your campaign will make it a lot easier for you to hit your goal. For example, you have most likely seen several crowdfunding events in the news, and you probably felt compelled to donate to at least one of these causes. This helps highlight the importance of connecting with members of the local media, and adding this into your overall marketing efforts could make the difference between hitting your goal and falling short. There are several professionals who have tips that will help you capture the attention of your local news. We have compiled some of the most useful and intriguing tips to help you get started. 88: Keep It Short: According to Brett Nelson’s 14 years of experience, one of the most vital things to remember is that you need to keep it short when you reach out to the media. In fact, he said “if they have to scroll, your email is too long.” In other words, Brett is trying to get the point across that you need to stick with only the most important facts to capture attention and help media personnel determine how to move forward with your story. You can learn more about Brett’s approach to getting press coverage by visiting his 12 step guide on Forbes.com. This is a great point that helps emphasize the importance of providing details about your medical fundraiser in order to create an emotional connection with your readers. We previously spoke about the necessity of creating a good biography section in order to link you to your cause, and if you took this advice, you should already be prepared to give the media a heart tugging but completely honest story that will make them intrigued by your medical crowdfunding efforts. 90: Use the Scraper Extension to Connect with the Right Publishers: Although this is a bit technical, Austin Allred provides the relatively easy to follow and implement tip that showcases a browser extension that helps you gather relevant and key sites to reach out to that will be more inclined to be interested in your specific story. Austin’s post about this topic is fantastic because it offers step by step directions that will help you find the right sites by using the right tools. Here is an excerpt that features Austin discussing his site scraper: “We’re going to use a couple of sites that rank blogs within their categories and scrape for the URLs blogs in the applicable categories. First, download the Scraper Chrome Extension or its equivalent in the browser of your choice. Now we go to our blog ranking website. Let’s start with Alltop. Go to Alltop and find your category, remembering to be as narrow as possible.” To find out more about this process and how you can put it to work for your campaign, you can visit Austin’s in-depth explanatory article by clicking here. 92: As you can see, this means that it is a good idea to connect with any local media sources, even if they do not have a large audience. This is a basic psychological principle that is displayed over and over again in multiple aspects of your life. For example, you are probably more likely to go see a new movie if at least one person you know has recommended it, and each additional recommendation will make you more inclined to head to the theater as quickly as possible. Applying this same technique to your fundraiser’s press coverage will help you capture the attention of some of the largest and most influential media outlets in your local area. Most fundraising hosts forget about the fact that they can take advantage of all of the time that they spend walking through their local community. For example, every time you go to the grocery store, all of the other customers are exposed to the images and text on your T-shirt and hat. With this in mind, it makes sense to give all of these eyes that will be on you access to information about your campaign. In other words, you should turn yourself into a walking billboard. that gives you the ability to design your own shirt. You will not be limited to simply using text either. Instead, you will have the opportunity to upload a relevant image and place it on your shirt along with the URL of supporters should visit to make an online donation. It is important to note that harnessing this easy marketing opportunity will be more effective if you are utilizing a custom URL, but you can still use a DonationTo permalink on your T-shirt. Another idea is to sell your own shirts to raise additional awareness and money for your medical cause using teespring.com. Here it is easy to create your own design and then sell your shirts. 94: The shirt that you design will provide you with a new promotional method, and it is also a very good way to capture attention and start conversations. The reality is that this is exactly what you need to do in order to raise enough money to hit your goal, so it is definitely a good idea to consider getting a T-shirt made. As an added bonus, after you design your shirt, you will be able to use this promotional material in multiple ways. For example, you can give everyone on your fundraising team a T-shirt and have them commit to wearing it whenever they go somewhere that will have a large group of people. 95: Additionally, you could offer T-shirts as a tier reward for people who donate above a specific level. Make sure that you select a high enough contribution to make it worth your while. In other words, if the shirts cost $15 to make, you should probably reserve them for people who donate at least $100 so that you can maximize each contribution. Alternatively, you can offer them as an additional fundraising method and charge $25 to supporters who are locally based so that you end up with a large group of walking billboards while still making $10 per shirt for your campaign. Please note that this would need to be handled separately from your DonationTo page, but you could certainly mention it on your page. 96: Make a Hat: A T-shirt is a great start, but you should also consider taking your design and tweaking it as needed to fit properly on a hat. After all, hats can be less expensive, and they are also easier to wear on a daily basis. If you are running in a marathon to capture attention for your medical fundraiser, you can wear a hat for part of your race to capture extra attention for your cause. A lot of runners do not like wearing a hat while they are participating in a marathon, but you could certainly put it on as you cross the finish line or while you are resting right after the race. People who are not tying their crowdfunding efforts to a marathon can simply wear their hat whenever they go out of the house. 97: Obtaining a custom hat to capture attention and start conversations is easy to do. There are many sites that offer this service, and one of your options is the create your own embroidered hat feature that is offered by Zazzle.com. Again, taking this step will give you the opportunity to get additional people involved in the walking billboard portion of your campaign. For example, if you are running in a marathon, you can make sure that some of your supporters are wearing a hat while they cheer you on from the sidelines. A hat could also be tied to tiered rewards or used as a separate fundraising method in the same way that was previously discussed for T-shirts. 98: The ultimate goal of creating items such as T-shirts and hats is to get the URL for your page in front of as many people as possible. As the fundraising host, you might also consider printing out some free business cards that contain the URL of your DonationTo page so that you can hand them to people who express interest in your hat or shirt. This is another great way to ensure that they do not forget the URL, and it will help them get in touch with you later if they have any questions. As an added bonus, if you happen to run into a member of the media or an influential local business owner, handing out a business card will be a great way to make sure that they are able to follow-up with you for a news story or to make a major contribution. 99: You should also consider making some flyers that can be posted in local store windows and in business break rooms. Having these flyers with you at all times will allow you to segue from a conversation about your shirt or hat into a request to post an informative flyer to help your campaign gain additional support from your local community. 100: Every person who makes an online donation to your campaign via our donation website for medical bills should receive a personalized thank you email. This is important because it will make people feel like their contribution was truly appreciated, and it will also make them more inclined to donate again in the future. After all, you might need to ask the same people for additional support if you are unable to meet your goal, so you need them to feel satisfied with the results of their first online donation. 101: Before you move forward with sending a thank you email, you should take the time to carefully reflect upon what their donation has enabled you to do. In the example of Sarah’s fundraising campaign, you would want to take a look back at the original issue so that you can comment upon the impact that their donation had on helping you move forward financially with Sarah’s medical bills. Once you have considered these factors, you will be in a much better position to create an appropriate and well worded thank you email. Keep in mind that these messages do not need to be extremely long, but they should offer some information to make the contributor feel like they personally had a real impact on your campaign. Sarah went to her final cancer treatment this week, and her doctors say that she is making fantastic progress. This would not have been possible without your thoughtful and generous donation of $300. As you know, cancer is a tough battle, and it is not easy for anyone. However, because of you, Sarah is now feeling so much better, and she can see the light at the end of the proverbial tunnel. Thank you for taking the time to think of Sarah while she was going through her five cancer treatments. I know that I speak on behalf of Sarah and everyone within our fundraising team when I say that your financial generosity has been truly appreciated, and it made a great difference in Sarah’s life during a very difficult time. 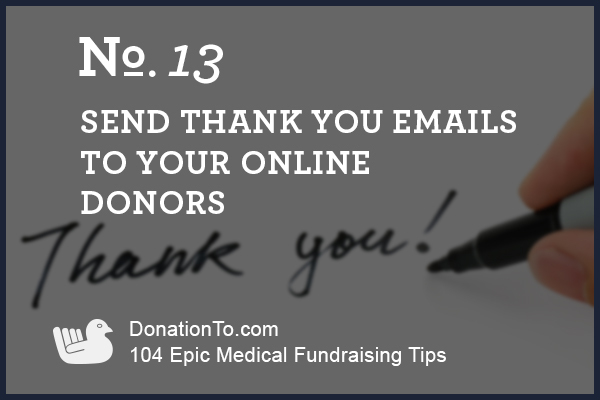 102: As you can see from this example, everyone who receives this type of thank you email will feel like their specific online donation played a vital role in Sarah’s medical fundraising campaign. The reality is that you can simply swap in the appropriate first name and donation amount for each contributor, but they will have the impression that you actually took the time to sit down and write a personal thank you to each person. This personalized approach will go a long way, and it will definitely make it easier to convince people to support your future crowdfunding efforts. Keep in mind that everyone likes to be thanked and kept in the loop when they are supporting a fundraiser. Therefore, whether someone gives you $1 or $100, they should still be treated with the same form of respect and receive a gracious thank you email. 103: The timing of your thank you messages is also important. Some people wait until the end of their campaign and send out all of their emails at once, but this is actually not the best course of action to follow. Instead, it is better to send out thank you messages at least once per week. There are multiple reasons for this, including the fact that it will be easier for you to touch base with everyone if you do not wait until you have a huge list of names to contact. Additionally, someone who donates on the first day of your campaign should not have to wait two months to receive a thank you because this will essentially make them feel like their contribution was not appreciated. Therefore, you will need to slightly tweak each round of thank you emails so that they will be relevant to the most recent progress that has been made. 104: Do not forget that one of the main perks of having a fundraising team assembled is the fact that you can turn to the best writer on your team to put together your thank you emails. Fortunately, even if you do not have a skilled writer assisting you, it should still be easy to simply tweak the email example that we provided above. In fact, all of the examples that have been included in this list of tips are yours to tweak and use as necessary to help get the word out about your crowdfunding efforts. 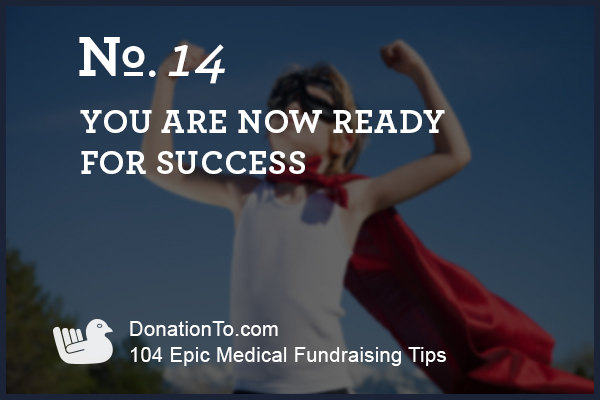 The 13 sections that preceded this area of our Epic Online Medical Fundraising Tips provided you with an intensive road map this should make it easy for anyone fundraiser to launch a successful campaign. If you need any additional assistance, you should definitely peruse our blog to gain access to a wide variety of additional tips that can help you maximize your crowdfunding efforts. You can also turn to our e-book entitled “The Book on Fundraising” or any of the following special posts: Fundraising Tips Part One, Fundraising Tips Part Two, Fundraising Mistakes and Increase Fundraising Donations Tips. As previously mentioned, you do have multiple choices when it comes to your online fundraising platform. However, DonationTo makes the most sense for anyone who is hosting a personal campaign. These campaigns can range from medical expenses to honeymoon funding, and there is a long list of reasons that you should turn to us for all of your crowdfunding needs. 2. You keep 100% of all donations – Most fundraising platforms charge a fee of at least 5 percent of each contribution. This adds up extremely quickly, and it makes the process of collecting online donations less beneficial because so much money ends up being wasted on fees. Fortunately, DonationTo has a much more cost-effective structure. We charge a nominal monthly fee ranging from $9-$24 in lieu of a percentage fee, and this will allow you to save an astronomical amount of money. For example, if you raise $10,000 in three months, you will pay $500 to most crowdfunding sites. DonationTo makes it possible to reduce this fee to only $27. As an added bonus, we will enable you to avoid paying for any extra credit card processing fees. When you add these two factors together, it is undeniable that DonationTo is the best fundraising resource from a financial perspective. 3. You Can Use Your Own Domain Name – We will give you a free permalink that will include the name of your campaign, but you also have the opportunity to take a bigger level of control over your page by signing up for your own domain name. This makes marketing much easier, and it will greatly improve the number of people who will be able to remember your URL. Therefore, we highly encourage each of our users take advantage of this option. 4. We Have Partnered with PayPal and WePay – Online payment processing is something that we take very seriously, and we want your donors to feel as comfortable as possible. Due to this, we have partnered with PayPal and WePay to give you the ability to collect and process payments via one or both of these respected and well-known websites. Most of your contributors will probably already have an account with WePay or PayPal, and this will definitely make them feel more encouraged to donate to your cause. 5. We Offer Email and Social Fundraising Tools – Whether this will be your first crowdfunding experience or your 50th, it is important for you to select a platform that assists you with your goal by giving you access to highly useful tools. For example, our one click email feature makes it easy for everyone to spread the word about your page. We also have a social networking integration tool that will enable you to share information easily and efficiently. 6. You Can Upload Unlimited Photo – The visual nature of the Internet makes it imperative to use images to capture the attention of your visitors. In fact, it has been proven that giving your potential supporters a look at the person or organization that their donation will assist is one of the best ways to increase contributions. This is caused by the fact that photographs help everyone feel more connected to a charitable cause, and this makes it much harder to say no. Therefore, we heavily encourage our users to take full advantage of our unlimited photo uploads feature. You can post new pictures throughout your campaign, and this will get people to visit your page on a regular basis. 7. No Technical Skills or Experience Needed – Our online donation website has been created with everyone from novices to experienced fundraisers in mind. In order to ensure that everyone is able to utilize our services, we have created a simple platform that does not require any special technical skills or previous fundraising experience. However, we also provide a robust enough platform that comes with so many extra tools that experienced fundraisers will enjoy making the switch to DonationTo. 8. Designed for desktop, tablets and mobile – Many medical donation websites are not fully equipped to provide the same high level experience to potential donors who are not using a smart phone or desktop. Fortunately, this is a problem that you will never need to worry about with DonationTo. In fact, we have optimized our site to be compatible with all web enabled devices. Therefore, if someone wants to make an online donation from their tablet or smartphone, they will be able to easily do so. Additionally, this enables people worldwide to contribute to your cause 24/7 from their credit or debit card via PayPal or WePay. 9. SEO Friendly for an Enhanced Campaign – Search engine optimization (SEO) is a very important aspect of your fundraiser. After all, this is what makes it possible for people to find your campaign by using Google or any other search engine. Due to this, we have placed a major emphasis on ensuring that each crowdfunding page we host is SEO friendly. This will also help you attract the attention of charitable individuals who do not know you but are looking for a cause similar to yours to assist. For example, some people search for cancer fundraisers so that they can make an online donation in honor of a loved one who they have lost to this disease. Our SEO friendly approach will improve the odds that your campaign will be the one that they choose to donate to. 10. Short URL for Social Media – Your URL is a critical aspect of your campaign, and it is necessary to carefully select the unique permalink or domain name that people can enter into their browser’s address bar. However, a descriptive URL that is easy to remember will end up taking a lot of space when you are putting up a post on Twitter and other social media websites. This can be problematic because Twitter only allows you to use 140 characters in each tweet. Fortunately, we solved this problem for all of our users, and you will receive a short URL that you can utilize when you post updates about your campaign via social media. Ultimately, the best online donation website for you is the one that helps you save money and attract a large audience. Our platform will definitely do both of these things, and you will also be able to access a lot of informative tips that will help you enhance your current and future campaigns. We are committed to helping you get the most out of your medical fundraiser, and this includes enhancing your ability to maximize each contribution. With all these perks, it is no wonder that we are the preferred crowdfunding platform of thousands of people worldwide. Hosting a medical fundraising campaign is a fantastic way to assist an individual who is dealing with exorbitant medical expenses. Even if you have never been in charge of a fundraiser before, you will be able to easily get started with the DonationTo platform. In fact, most people can launch their page within five minutes. However, there are many tips that we recommend utilizing in order to enhance your campaign and dramatically improve your odds of meeting or surpassing your goal. The very first thing that you should do is gather a small team of people who are committed to your campaign and can offer various talents such as writing and graphic design. Next, you will need to take the time to prepare your efforts before you launch your page. For example, setting up your PayPal or WePay account in advance will enable you to begin receiving donations in real time. It will also be critical to provide in-depth details about your cause that explain the need for charitable donations. Additionally, you will need relevant high-quality photos and videos that will help people relate to your campaign. Make sure that your crowdfunding team includes people who are skilled at writing emails and using social media. Choosing the right donation website for medical bills will make a big difference in the total amount of money that you are able to raise. After all, many of our competitors charge a 5 percent fee for each contribution, and this will eat up a surprisingly high amount of money. Fortunately, you can avoid this issue by selecting DonationTo instead. There are many aspects that will influence whether or not visitors to your page decide to make a medical donation. One of the biggest things that will have an impact on this thought process is the goal that you have set for your fundraiser. Due to this, you need to take the time to ensure that your goal is attainable and well thought out. You must be able to indicate exactly why you need this specific amount, and you should provide this information on your DonationTo page. Always remember that transparency will go a long way toward convincing people to support your fundraising efforts. You should get some of your close family and friends to make online donations and leave comments on your page before you begin sharing the URL with others. This will show forward momentum, and it will make people feel more encouraged to participate. After this step has been achieved, you will want to introduce your campaign by sending an email to all of your anticipated supporters. Next, you and your entire team will need to post information about your fundraiser via a variety of social media sites. Make sure that you do this on a regular basis, and send out a weekly update email to keep everyone in the loop. There are many things that you can use to your advantage to increase contributions, including offering tiered rewards and making campaign T-shirts and hats. You can also reach out to the local press to help you raise awareness of your campaign. Make sure that you send out thank you emails at least once per week so that the people who do contribute will feel like their assistance was truly appreciated. It is important to send everyone a follow-up message after your fundraiser ends so that they can find out whether or not you met your goal and how the impacted individual or organization has used their donation. Following all of these tips will help your medical crowdfunding campaign become a complete success.